Here it is. The original Chewbacca figure from Kenner. 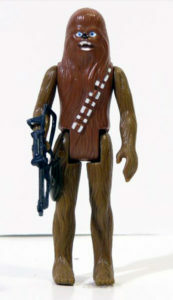 Che wbacca was actually one of the first four figures produced in the line. In fact, Chewie was part of the famous “Early Bird” pack that Kenner sold at Christmas in 1977. Kenner didn’t have time to produce figures in time for Christmas, so they sold an empty box with a cardboard display stand and a mail-in certificate that kids could redeem for 4 action figures – Luke, Leia, R2D2, and Chewbacca. The figures shipped out to kids all over the country in the spring of 1978. (If you want to know more about the Early Bird Package, jump on over to Gus Lopez’ site THE STAR WARS COLLECTOR’S ARCHIVE). I seem to remember going through 3 or 4 Chewie’s when I was a kid. He was all brown, and got lost easily in the grass – only to be found by the lawnmower. This is the last Chewie I purchased when I was a kid. You can see how his arms and legs have discolored. That’s common, as the arms and legs were actually made from a different plastic than the torso was.